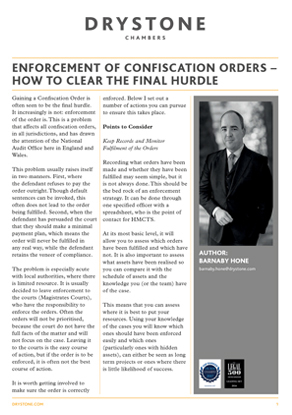 In this short article, Barnaby Hone explores the challenges facing prosecuting authorities post-confiscation order. The confiscation order is simply the start of a new process: enforcement. The following article explores ways of ensuring effective enforcement and provides a handy checklist of points to consider when taking steps to enforce a confiscation order.